The important experience in our everyday life is the sensory experience, for this we are equipped with ears for the detection of sound. Basically, all types of sounds which we experience are created by vibrating objects and propagate through a material medium as a wave, i.e. a medium transports the mechanical energy created by the vibrating particle from one point to another without shifting the material particles of the medium. For human beings, the range of hearing is limited to frequencies 20Hz to 20kHz, whereas a dog can perceive vibration higher than 20 kHz, i.e. upto 45000 Hz. Sound waves are the longitudinal waves because the vibration of the particle in a medium is parallel to the direction of propagation of the wave. As a result compression and rarefaction regions are formed. These involve changes in volume and density of the medium. To verify the laws of reflections of sound. Reflection is the change in direction of a wavefront at an interface between two different media so that the wavefront returns into the medium from which it originated. Common examples include the reflection of light, sound and water waves. Do you know how sound propagates? Sound propagates through air as a longitudinal wave. The speed of sound is determined by the properties of the air, and not by the frequency or amplitude of the sound. If a sound is not absorbed or transmitted when it strikes a surface, it is reflected. The law for reflection is the same as that of light, ie., the angle of incidence of a sound wave equals the angle of reflection, just as if it were produced by a 'mirror image' of the stimulus on the opposite side of the surface. How do we describe the reflection of sound? When sound travels in a given medium, it strikes the surface of another medium and bounces back in some other direction, this phenomenon is called the reflection of sound. The waves are called the incident and reflected sound waves. What are incident and reflected sound waves? 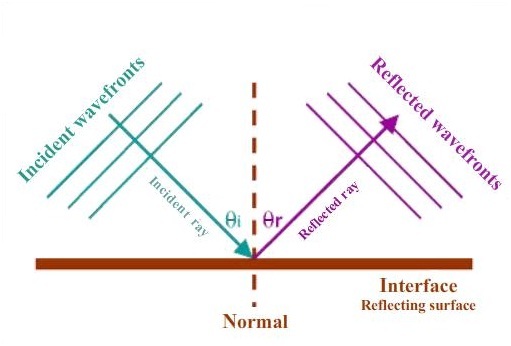 The sound waves that travel towards the reflecting surface are called the incident sound waves. The sound waves bouncing back from the reflecting surface are called reflected sound waves. For all practical purposes, the point of incidence and the point of reflection are the same point on the reflecting surface. A perpendicular drawn on the point of incidence is called the normal. The angle which the incident sound waves makes with the normal is called the angle of incidence, "i". The angle which the reflected sound waves makes with the normal is called the angle of reflection, "r". The incident wave, the normal to the reflecting surface and the reflected wave at the point of incidence lie in the same plane. The angle of incidence ∠i is equal to the angle of reflection ∠r. 1. Two glass tubes of 3 ft. in length and 2 inches in diameter. 2. Vertical reflector (say a polished wooden drawing board). 3. Sounding body (Galton's whistle or clock). 1. Arrange two glass tubes; AB and CD each horizontally at some angle in front of a vertical reflector R1R2 (a polished wooden drawing board). 2. At the mouth A, of the tube AB, place a sounding body (a tuning fork or a clock). 3. Adjust the inclination of the tube CD with respect to the reflector R1R2 so that the sound is distinctly and loudly heard when the ear is placed at D.
4. Mark the portion of tube AB and CD. 5. Draw a dotted line from the centre of diameter of tube AB and CD and extend up to reflector board. Draw a normal. 7. ∠AON called angle of incidence, ∠i. 1. The tubes carrying sound waves, the normal to the vertical reflector and the reflected wave are in the same plane. From the above observations, we can conclude that angle of incidence ∠i = angle of reflection∠r. 1. Since the tubes are normal to the vertical reflector, and the reflected wave lie on one and the same plane, the First Law is verified. 2. The angles of incidence and the angle of reflection of sound are found to be equal, which verifies the Second Law. 1. The inner surface of the metallic tube should be highly polished. 2. Metal plate should be highly polished. 3. The tuning fork should be close to the tube, but it should not touch the tube. 4. 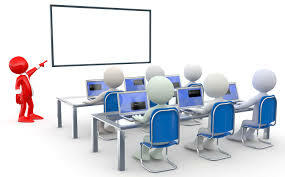 There should be complete silence in the laboratory so that sound from other sources does not interfere. 5. The ends of metallic tubes should project out at least 1cm from the edge of the table top.